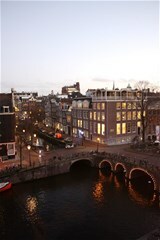 Herengracht 72 II Amsterdam - Peter Bruin Makelaardij o.g. b.v. The house is situated on the Herengracht near the popular Jordaan neighborhood and multiple artistique cafes, restaurants and galleries. Within walking distance are many trendy boutiques and shops. The farmers market on the Noordermarkt each Saturday is the most trendy of the Amsterdam markets and only a few minutes' walk from the apartment. Furthermore, there are excellent public transport facility nearby. Located in the front of the apartment is the living room with three large windows overlooking the canals. Fully equipped open kitchen and dining area. Original wooden doors give access to the master bedroom. Renovated bathroom with shower, washbasin and toilet. The rental price of € 1.850,-- is excluding utilities and including cable TV & Internet. The apartment is for rent preferably for expats with owner`s prior consent.